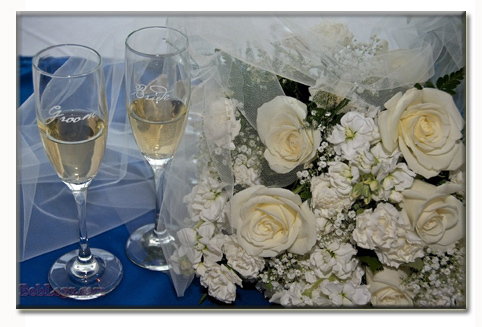 Your Wedding Day is special and Bob and his wife Eileen will devote the day to your wedding. In fact, they do only one wedding or event per day so you'll have their complete focus and enthusiasm. In preparation, they will call a few days before the wedding gathering any last minute photo requests as well as the order of events, and any other details of the special day. They typically arrive early to scope out your wedding location if they are unfamiliar. Eileen generally follows the bride through the dressing process before ceremony to catch those special moments with the bride's family and close friends. Bob and Eileen use a blend of photographic styles resulting in a creative documentation of your special day. The linked wedding galleries show hundreds of examples. Their approach is to be very flexible and adaptable so that you'll get the results you want while the event unfolds as you have planned. All packages include your images on disc(s) in high resolution ready to print format with shared copyright.